If you need a nice ride in the beautiful city Qingdao, just simply contact us now to get our BEST QUOTES and GREATEST SERVICES today! Car rental serivice provider in Qingdao city China ! We drive your way in Qingdao! Qingdao also known as Tsingtao, is a major city in eastern Shandongprovince, It borders Yantai to the northeast, Weifang to the west and Rizhao to the southeast. Lying across the Shandong Peninsula while facing to the Yellow Sea, Qingdao today is a major seaport and also the industrial center in China. 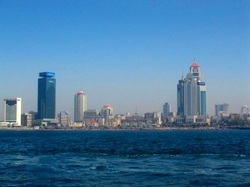 Qingdao has a temperate, four-season climate. Winter is cool to cold and windy, but generally dry, Summer is generally hot and humid, but very hot days are rare, with an average temperature of 25.3 °C (77.5 °F) in August.Due to its proximity to the coast and being on a peninsula, it experiences a one-month delayed spring compared to most inland areas of China. Qingdao is a famous garden city in China, it attracts many tourists due to its seaside setting and pleasant weather. Parks, beaches, sculpture and unique German and modern architecture make this seaport city an ideal tourist destination. Qingdao also experienced rapid economy development, Internationally, Qingdao is perhaps best known for its Tsingtao Brewery, founded by a German-British joint venture in 1903 that produces Tsingtao beer, the most famous beer in China. It is also home to Haier, a large house appliance manufacturer, and Hisense, a major electronics company in China. In 2002 guitar manufacturer Epiphone opened a factory in Qingdao. Qingdao is also home to a variety of mineral resources,up to thirty different types of minerals have been mined. Recently , Qingdao has been rated among the top ten most livable cities in China. Shanghai Car Rental Service will be very honored to have the opportunity to serve you in Qingdao with our great limousine services, we will insure a hassle-free, most comfortable trip no matter you are traveling Qingdao for official business visits or personal tourists. All our drivers are from local and they are all licensed, well trained and with more than 6 years’ experience in serving our foreign customers, they are also quite familiar with the routes in Qingdao and other cities in Shangdong Province ,can easily drive you wherever you want. ◆Qingdao airport transfer services ,hotel pick up and drop off . ◆ Qingdao railway /bus station/ transfer services . ◆Grand transportation or transfer /shuttle services for Fair/ Event /Exhibitons in Qingdao regions ( Convention center to hotel and hotel to convention center) ( MPvS, Luxury Sedan , buses and coaches are availale for such services ). ◆ Qingdao Daily Limousine or car rental services (chauffer services) for short term period, include Qingdao Business tours or factory visits to neighborhood cities in Ji'an,Weihai, weifang,Zibo,Rizhao and other cities in Shangdong province . City sighseeing tour sedan /mini van/mini bus/coach services for individual or group travelers. ◆Long-term car lease for individuals or cooperates in Qingdao.